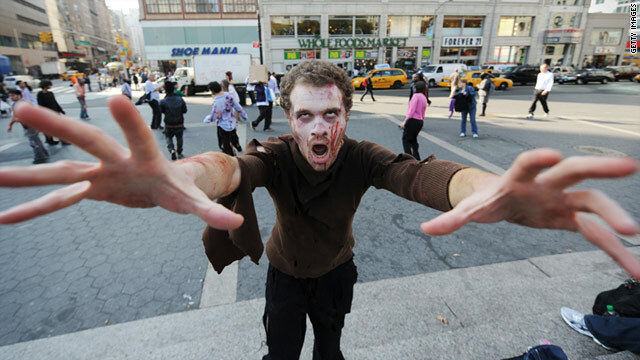 Would you be ready for zombies? Dr. Ali S. Khan doesn't really expect the dead to rise -- but he does like "Resident Evil"
(CNN) -- The Centers for Disease Control and Prevention is a big, serious government agency with a big, serious job: protecting public health from threats ranging from hurricanes to bird flu. So when the good doctors of Atlanta warned people this week about how to prepare for a zombie apocalypse, the world took notice. "That's right, I said z-o-m-b-i-e a-p-o-c-a-l-y-p-s-e," Dr. Ali S. Khan wrote on the CDC website this week, adding casually that "Resident Evil" is his "personal favorite" zombie movie. As it happens, Khan, one of the nation's top-ranking public health professionals (he's a rear admiral and an assistant surgeon general), doesn't actually believe the living dead are about to claw their way out of graves and start chewing on your brain. But, he and his communications team recently noticed, what they'd want you to do if the world really did suddenly go "Night of the Living Dead" is pretty much the same thing they'd want you to do in case of a hurricane or a major pandemic. From that realization to the decision actually to put up a blog post was a short step, Khan said Thursday. Khan floated the idea of what to do in a meteor strike on earth not long after becoming director of CDC's Office of Public Health Preparedness and Response eight months ago, he said, so his staff knew he was open to "novel and creative ideas to engage the public." Then the CDC got a question about zombies during an online chat about radiation leaks related to the meltdown at Japan's Fukushima Daiichi nuclear plant in March, and they saw traffic spike. Khan and his communications team knew they'd found a way to get the public interested in disaster preparedness, he said. "You have a 'Resident Evil' movie coming out, 'Shaun of the Dead,' 'World War Z.' It's a good metaphor for where you have complete disruption," he said. So they posted the advice on Monday. Their website crashed on Wednesday. Make an emergency plan. Stockpile food, water and medicine. Have a utility knife, duct tape and battery-powered radio handy, along with some changes of clothes and bedding. And keep some cleaning supplies handy, along with key personal documents like a driver's license and birth certificate. The CDC also recommends having basic first aid supplies handy for a hurricane or a pandemic -- although, Khan admits on the CDC blog, "you're a goner if a zombie bites you."